Before enrolling at ANU, Kate participated in a program that allowed her to experience life as an Asian Studies student for a day. Having studied Indonesian since primary school, Kate knew that an Asian Studies degree at ANU was the only option she was interested in. “The teachers at what was then the Faculty of Asian Studies were such wonderful and fascinating people, and I wanted to be a part of that,” says Kate. As part of her Bachelor of Asian Studies, Kate majored in both Indonesian and Japanese, but also enjoyed the wide ranges of courses that helped set her up with the skills to live and work in Asia. 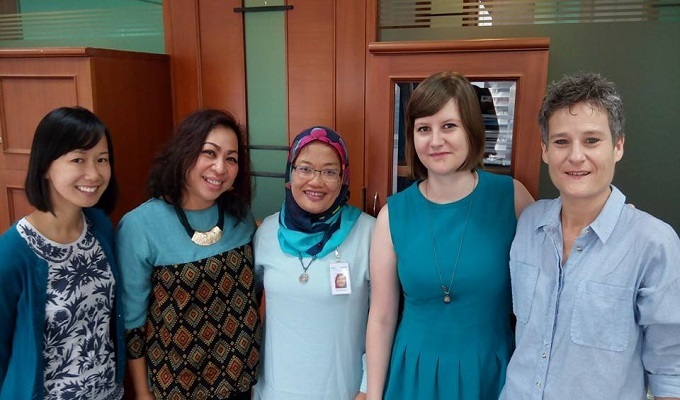 After graduating with Honours, Kate began working on a series of Australian aid projects across Indonesia before commencing on a USAID project called Kinerja, which focuses on improving public services in health and education in Indonesia. In addition to her full-time work with USAID, Kate runs an independent project called Menghitung Pembunuhan Perempuan (Counting Dead Women), which collates figures on women murdered in Indonesia. She describes the project as “an attempt to highlight the high level of violence against women in Indonesia, and to encourage the government to improve services for survivors and develop prevention programs.” Kate’s hard work on this project has been featured on the ABC.